I am sitting at work waiting for a few thousand files to download to my computer (Computer Programmer by way is my job) and was thinking wow what is all this crap sitting on my desk. 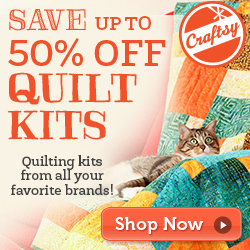 My new passion of quilting is in the top right corner. Before I finished my first "Quilt" I created this mini quilt to make sure that a Rag Quilt was relay as easy as it sounds. So I guess you could say that is my first Complete. That mini quilt was finished the weekend before Christmas. My second treasure on the desk is the picture of Starry Night by Vincent van Gogh. This is one of my treasures because when I was going to school one of the required classes for my AS in Computer Science was a core class on the arts. I took a art appreciation class. The teacher for the whole quarter brought in a Starry Nights picture sat it on the chaulk board. Taught her class and then left. A week before finals some one finally asked what is with the picture. The teacher said that each new quarter she brings in a painting to each of her class and she does this until some one asks. She believed that part of appreciating art was noticing whats around us. She told us that she planned to fail any class that did not ask. In years of teaching we were the first she almost failed. She said that all her other classes caught on with in the first week. For almost an entire quarter she had to hustle back to her office and get the painting, come to class, then return it before her next class any way funny memory and it will always be a treasure. In the middle you see a biason this is my reminder of Yellowstone if you have not been their go. If you have and want to be taunted by my pictures go here. Yellowstone Pictures I have over 1000 Yellowstone pictures on that site along with hundreds of other family pictures. Feel free to check it out and rate some pictures. In the picture frames are my kids. You can never have enough kid pictures (again look at my link above to see the pictures. My youngest son Jared has over 500 of just him). Can't wait until my baby is born in March to add some of her in. The Micky Mouse shot glass was given to me by a co-worker back from vacation (taunting me that he was there and I was not) Oh well Yellowstone to me is more enjoyable. I don't drink so what do I need a shot glass for any way. Last but NOT least a man needs to defend himself from his co-workers. 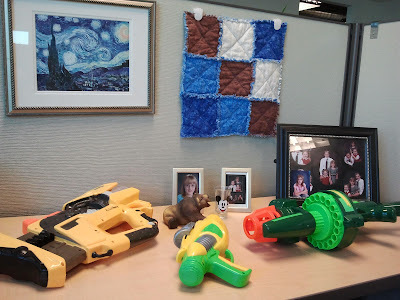 At work we work hard, and when we are done working (or when we need some stress relief) we take it out on each other with our Nerf Guns. All 3 of which I picked up at thrift stores. Cute little mini quilt! I recently made my first rag quilt, and it was a ton of fun! I was hesitant at first, and making a mini like you did is a wonderful idea!